what’s got more cherries than the front row of a One Direction concert? 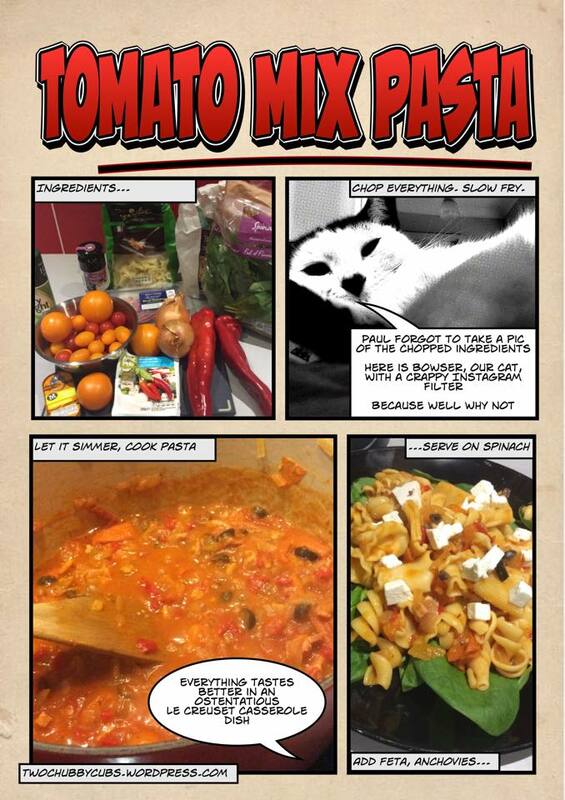 ingredients: pack of bacon medallions (unsmoked), a veritable United Colours of Benetton range of tomatoes, two sweet peppers, sliced olives, two onions, oxo cube, any scratty bits of pasta you have left over, spinach and reduced fat feta to serve. recipe: finely chop the onion, chilli, bacon and peppers and chuck them in a heavy pot with a lid to sweat down, then chop the various tomatoes to different sizes and add them to the mix. Simmer for a few minutes and add two tablespoons of tomato puree and 250ml of chicken stock. leave to simmer on a reasonable heat for twenty minutes or so. Cook and drain your pasta, and do it well for goodness sake as nobody likes watery pasta. tip into the tomato mix, shake it like a Polaroid picture and serve on a bed of spinach (another superfree) and top with reduced fat feta. Paul adds anchovies to his because he’s a sick, sick man. extra-easy: perfect extra-easy meal, given the amount of tomatoes, peppers and onions in the pot which all count as superfree foods – you could always chuck in some peas or shredded leek. warning: we used frylight, but if you use oil to fry, make sure you syn it. one teaspoon of olive oil is 2 syns – blimey. If you decide to use bacon as we have done, buy the medallions without fat or trim everything off. finally, olives – eight black olives are one syn altogether. top tips: although Paul doesn’t trust me enough to do this yet, after eight years of marriage, you can just chuck your pasta straight into the sauce and cook it in the sauce rather than water. It’ll make the sauce thicker and it works a lot better with decent pasta, but it’s brilliant. Try it with spaghetti when you next make spaghetti bolognese.